TFS (Team Foundation Server) is a tool which delivers source control, work item tracking, Team Foundation Build, reporting, and project management capabilities. 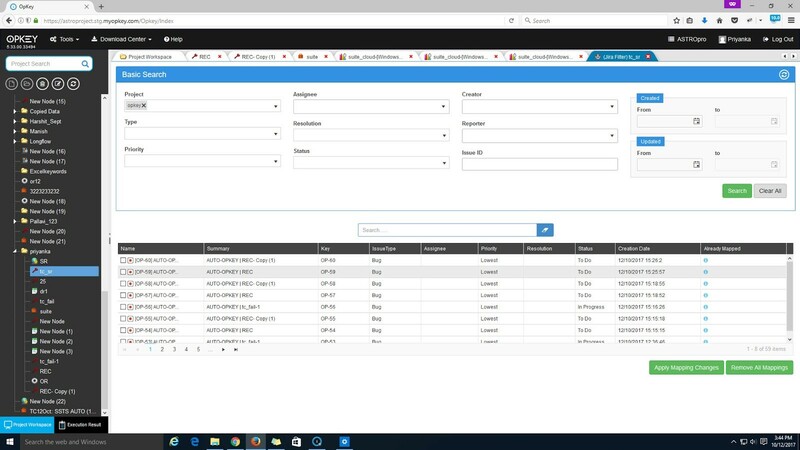 Team Foundation Server also includes a data warehouse where data from work item tracking, source control, builds, and testing tools are stored. Team Foundation Server has now been integrated with OpKey Web. 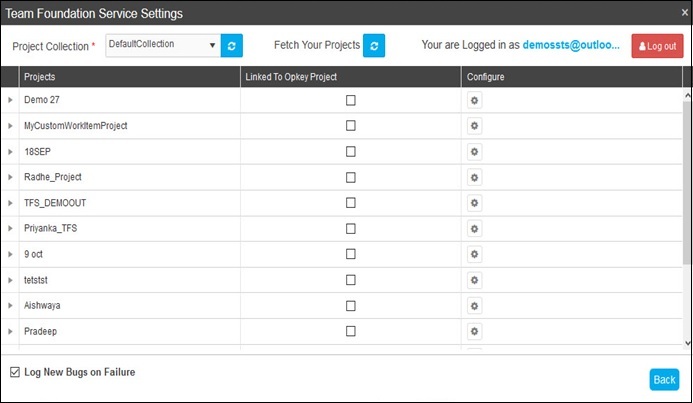 By using this feature, you can map your project artifacts to log new bugs, update status of logged bugs etc. To use TFS Server with OpKey, you need to install it on a Windows (Windows 7 and above) machine having standard configuration. Once it is installed on your machine successfully, you first need to configure it. 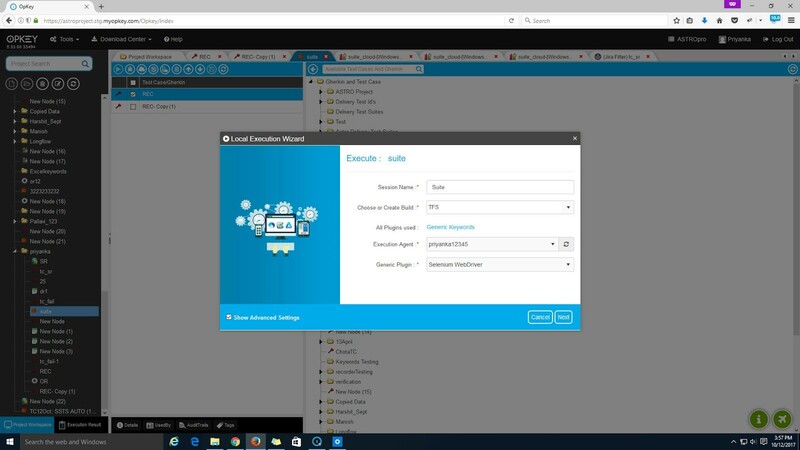 To configure TFS Server, go to the Start button and click on Team Foundation Server Administration Console. 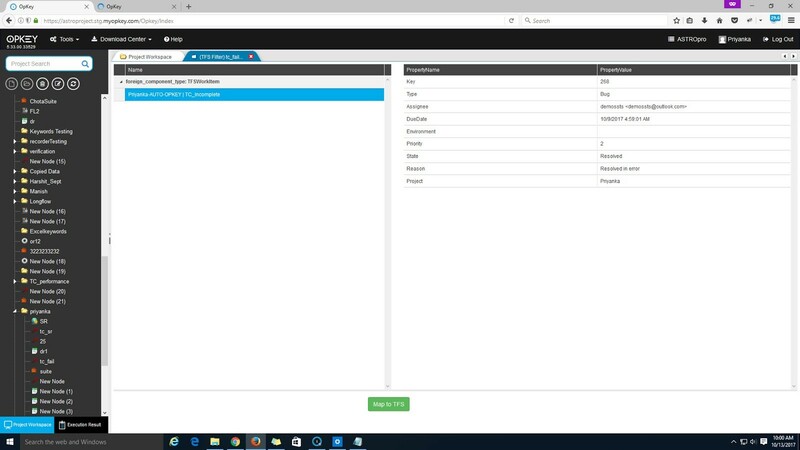 Team Foundation Server Administration Console page opens. Go to the Application Tier tab to view the Application Tier Summary. Default Server URL is given in the Application Tier Summary which works as a accessible URL on browser. You should replace http://localhost part of the Server URL with the IP Address of the local machine. OpKey supports TFS version 2017 Update 2 & Java 8. Open web browser and enter Server URL (with IP Address). You are asked to enter Username and Password. Login with your valid credentials. After successful login, the TFS Home page opens. Go to the Team Project Collections tab in Team Foundation Server Administration Console. From here, you can create new collections as required. To do so, click on Create Collection. It is mandatory to create a new Project so that you can work on that Project. Enter the name of Collection to be created. You can also enter description of the creating Collection. Click on Verify to verify it first. You can see here that verification process is has completed successfully. Click on Create to create a Collection. Collection creation process is going on. TFS Collection creation process has completed. Click on Complete to finish it. Process of Review Supplemental Information for the Team Project collection has passed successfully. Now, go to the TFS home page on the browser. Click on Browse to view created Collection(s). Here, you can view the list of Collections. As name suggest, DefaultCollection is the default created Collection. Here, we have created another Collection, named as RSP1. Let us create Project(s) within the Collection(s). Click on New Project. Create new project window opens. Fill all required fields and click on Create. New project has been created. Here, you can view its location. Now, you need to upload and install OpKey Extension. Click on Manage Extensions. OpKey TFS Extension shows new/mapped Work Item “Bug” logged through OpKey. Click on Browse local extensions. 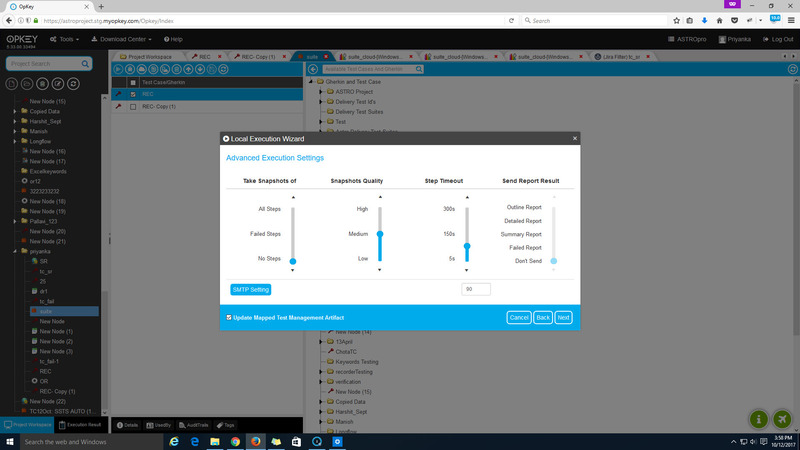 Click on Manage extensions under Manage Extensions tab. Click on the Upload new extension. Browse and select your extension. Once it gets uploaded successfully, click on Install to begin installation process. Once, your extension gets installed successfully, you need to confirm for the permissions to be granted. Click on Confirm. Now, the OpKey TFS Extension has been installed under DefaultCollection and ready to use. You need to install OpKey TFS Extension for each collections separately. Now you need to execute OpKey TFS Utility. This utility is used for adding OpKey Execution Stats tab to the work items. Launch this utility and enter required credentials (Server URL, UserName & Password). User can easily find the Server URL, Username & Password. For example: suppose the Server URL in TFS Administration console is http://localhost:8080/tfs/ and the local machine IP is 172.17.20.152 then the Server URL will be http://172.17.20.152:8080/tfs/. Enter this TFS Server URL on browser to work on TFS. You can find the ServerURL, Username & Password from the Team Foundation Server Administration Console. You need to run OpKey TFS Utility every time while creating a new Collection or Project in TFS. It is required to add OpKey Execution Stats tab to the work items. Under OpKey Execution Stats, you can view your Test Artifacts and other details. Let us see how to map OpKey projects with TFS and use it. Open OpKey Auth. 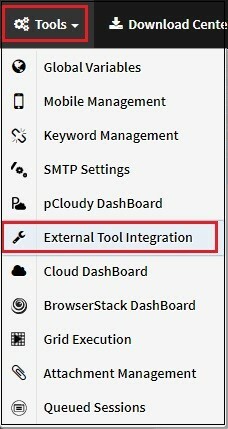 Click on External Tool Integration under Tools menu. Check Use For Test Management checkbox and click on Configure icon. TFS Settings page opens. Fill all required fields. Click on dropdown icon in Project Collection to view all Collections. There are two Collections, DefaultCollection and RSP1. DefaultCollection is default Collection whereas RSP1 is manually created Collection. Let us see how bugs are automatically logged on TFS when a Test Script is failed. Create a Test Case in OpKey. Make sure that it should get failed during execution. Example: Here, we have created a Test Case having few test steps. Data input argument are not given so that it can get failed. 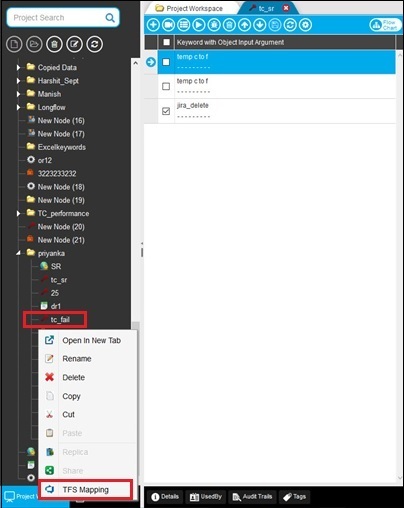 Make sure that Automatically Bug Logging checkbox is selected, it automatically log a bug in selected project in TFS for the failed test case or scenarios. If bug is already logged then it updates that bug. Click on Run Now to execute it. Run Now Wizard opens. Fill all required fields and check Show Advanced Settings. Click on Next. Check Update Mapped Test management Artifact checkbox and click on Next. Here, you can view that the execution process gets completed and execution get failed. Within Execution Logs, you can view that it is connected with Team Foundation Server (TFS) and logged a new bug in TFS with ID RSP_Project-Auto-OpKey | TC1 (2) for Flow TC1. Now, on TFS you can view the logged bug. Go to the OpKey Execution Stats tab to view details about the executed Test Case and Test Steps. OpKey Execution Stats contains detailed information about the executed Test Script and its Test Steps. Let us see TFS mapping details. 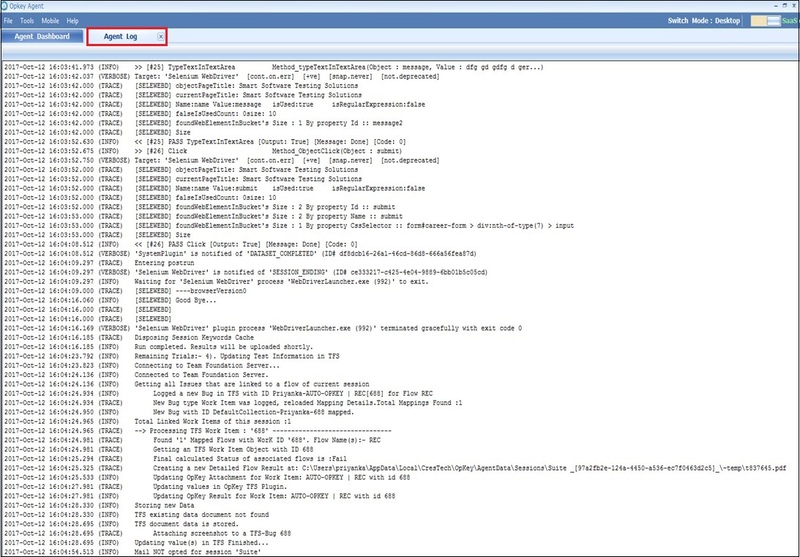 Here, you can map logged bugs (work item) in TFS Local Server. Right click on the Test Case and click on TFS Mapping. TFS Mapping Details page opens. Check work item checkbox and click on Map to TFS. Apply TFS Query Filter and click on Search. You can apply Basic TFS Query Filter. Here you can view list of bugs (work items) with details. Check work item checkboxes and click on Apply Mapping Changes. Once all mapping successfully saved, a popup message appears that “All Mapping Successfully Saved“. 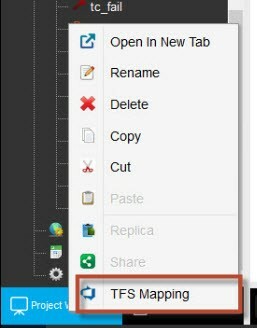 Now, the mapped work items in TFS Cloud will be updated when associated Test Script will be executed. Let us execute the Test Case again. Click on Run Now (F5) to begin execution process and click on Next untill execution process gets started. Once execution process gets completed, you can view the execution logs that the mapped bug has been updated and new ids corresponding to that bug has also been logged. A work item in TFS represents an entity which can be work that needs to be accomplished, a risk to track, a test case, a bug or virtually anything else a user can imagine. Work items are combined into a Process Template that contains these and other pieces of information to provide a development framework. Work items can be linked to each other using different relationships to create a hierarchical tree of work items. 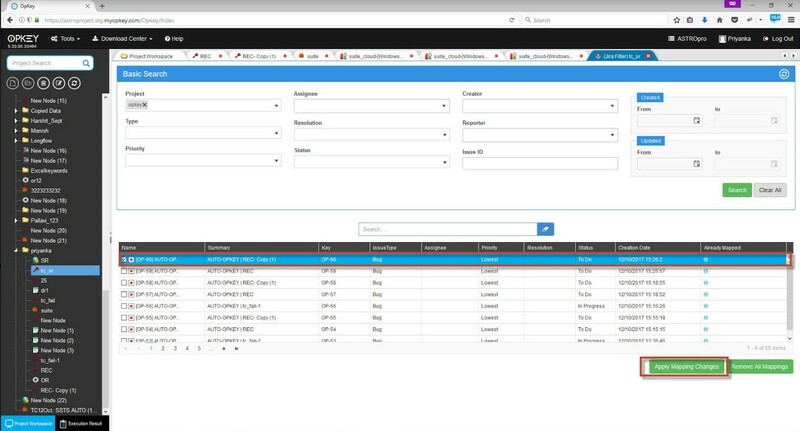 The flexibility in the work item system allows TFS to play many roles from requirements management to bug tracking, risk and issue tracking, as well as recording the results of reviews.